Full disclosure – I received a free copy of this book from the author as part of his launch team in exchange for an honest review. While listed as 4th in the Z-Minus series this is actually the first book in a three book series and not related to the previous books. 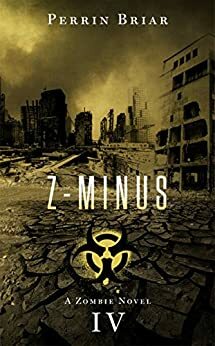 Z-Minus 4 is the story of a special ops team freshly back from Africa where they have spent the last several weeks dealing with an Ebola outbreak in a remote village. One by one, all of the team members are called suddenly back from leave for a training exercise centering on biological warfare is part of the simulation. Being chosen specifically for their experience with Ebola, the team must locate and extract the virus and get back out all in 8 hours. Their opponents in this exercise will be additional special ops teams and others whose sole objective is to thwart the completion of the mission. Sounds simple for a seasoned special ops team, right? Once the exercise is underway, it becomes clear that those pretending to be afflicted with the virus as part of the simulation may not be acting after all. The team finds themselves in the middle of a full-fledged zombie outbreak and now they must fight their way out or die trying. Overall I felt this was a really strong start to this series. The individual back stories and the Africa flashbacks built into the plotline added a depth to the characters and allowed the reader get inside their heads. The ending left enough unanswered questions to set up the next installment. This wasn’t a very long book, but sometimes good things come in small packages.